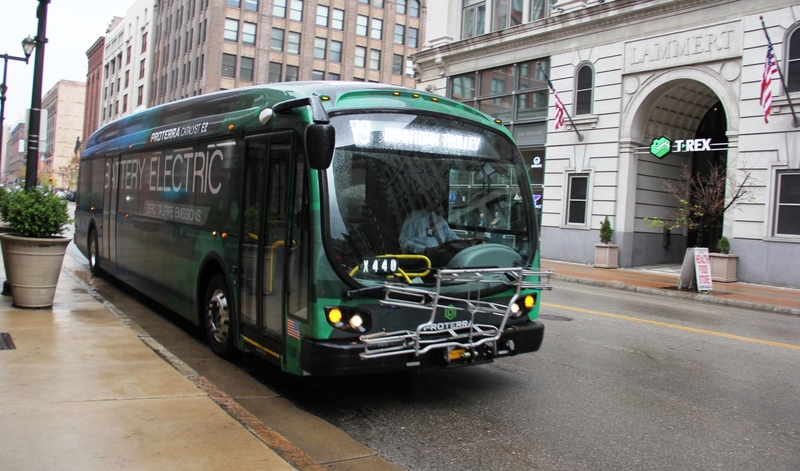 A test bus will be traveling through downtown St. Louis powered only by electricity, and you have an opportunity to take a ride and experience this technology firsthand. Metro will test drive a 42-foot all-electric bus on the #99 Downtown Trolley route, beginning today through Tuesday, April 11. The all-electric Proterra bus, part of the E2 all-electric series, can safely operate on a single charge for about 250 miles. The bus is powered by a magnetic drive motor with a 2-speed gear box. The battery, which can store about 440 kilowatts of electricity, takes less than four hours to recharge. The testing will allow MetroBus operators and Metro’s maintenance team to see the bus in action and evaluate its performance, including how it operates under different passenger loads and in changing traffic and environmental conditions. For an electric bus to be a candidate for the MetroBus fleet, it will need to produce the same performance as current clean-diesel MetroBus vehicles, which average about 200 miles a day. The electric bus must also meet the vehicle standards set by Metro’s internationally recognized maintenance program, which leads the transit industry in several reliability, efficiency and maintenance metrics, including extending the lifespan of its buses to 15 years and more than 750,000 miles, beyond industry standards of 12 years and 500,000 miles. If you get a chance to take a ride on the Proterra electric bus, let us know what your experience was like by sharing your feedback in the comment section below. I did not see this bus run all day Saturday. Can you say what run it will be for the day so those that want to ride it can do so? It was a very nice ride on Sunday. This seems to be the best vehicle Metro has tested. I have been on all the vehicles tested since 2015.